Marina's Kitchen Table: Here's the Scoop!! What God can do in a YEAR! I've always been up for an adventure when it comes to traveling. Not an adventure of climbing high mountains, achieving strenuous physical activities, or jumping from outlandish bridges.... no, mine seems to be (thankfully) limited to traveling on the firm, solid, feet beneath me (except for those occasional flights) ground. And so, a year ago, when Mark was looking for a new challenge at work and the opportunity came for him to make a move to the corporate offices for his company, I was thrilled content to make a move to the area of NW AR. God handled it all in perfect timing. Our house in KY sold; we found a lovely home to settle in to. Our kids came to visit (and grandkids too!) and we settled in to a routine of church, weekly Bible study, and (trying) to build community. It wasn't perfect, but we saw God at work, listened HARD to His voice, and bumbled through life with Mark traveling WAY more than the 30% on his job description (he's been gone about 85% of the time this year) and me doing life in a usually empty house. We've had guests stay with us, made new friends with many college students, and had a chance to meet many new people that God had also "just brought" to this area. We tried to force-fit working with a ministry that didn't have the same vision or ethics of how we felt God lead us, even if they did great things - and learned how God can make things work well - even without me being in it. (He is not dependent on me - I am on HIM.) We found a church, left a church, and in being obedient to God in leaving He opened the door for us to "bump in to" my dad - whom I hadn't heard from in a year, or seen in over 3 years! We were able to be closer to our son, as he proposed and then married, the love of his life. It gave us the chance to be more a part of their plans, their life, because we were only 2 hours away instead of 8 hours away. We were able to connect with our neighbors, and meet new people that were also new to the area. I was able to work with DaySpring and learn what a missional God-serving company is like! Learned so much about blogging as I worked on Roy Lessin's blog, Meet Me In The Meadow. All of it has expanded my horizons in new ways of doing Social Media, and working there has been the jewel in living here. The women (and men) that I've met have taught me SO much, and I know that God has a plan for that knowledge to continue to work in other facets. I would love to continue to work with DaySpring - but I haven't heard about that yet - so I'll keep praying about God's will in that and trust Him to fill that spot with good things. But now. Now it's time to go! Mark's grown weary of traveling on the road (and I'm glad he wants to be home more!!) and an opportunity has arisen for him to work back in Kentucky, at the very plant he left, but in a new position with new opportunities! So in just a few weeks - he starts a new job! And my life will be in transition for a while - a season. I'll feel unsettled, and not have pictures hanging in the wall (may not even have my own furniture in the house!) and see the season's change. I'll chronicle my travels, and expect I'll put on miles, driving, flying, crying. I don't even know what I'll cry about - but I'm sure some wave of emotion will catch me off guard and throw me to my knees... and I'll stop trying to control the things I can not... and surrender it to Him again. I've walked this way before. I know the journey well, and I'm trying to start it off by remembering what not to do... and how to keep Him in charge of it all. 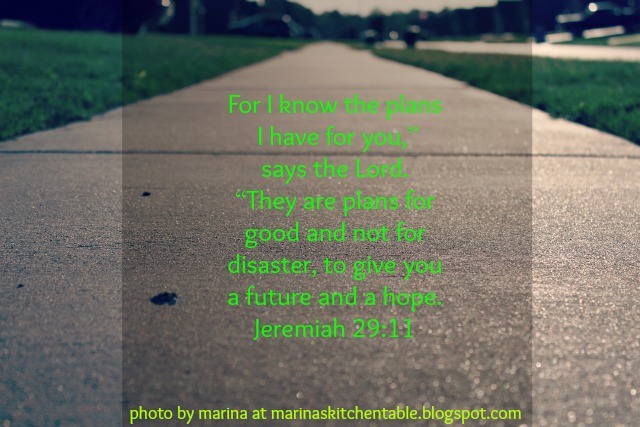 Let HIM plan my steps (not ME jump to conclusions) and allow HIM to fill my calendar (and not ME do what I want to do, or see happening, just because I did it before). Wow! What a year. A 'hang onto your hat' sorta year. I'm thankful for the friendship we've grown over the year, Can't wait to see how God is going to use you next year...and what adventure it will bring!